Length: 7 hrs. 16 min. Parenting is a school for spiritual formation—and our children are our teachers. 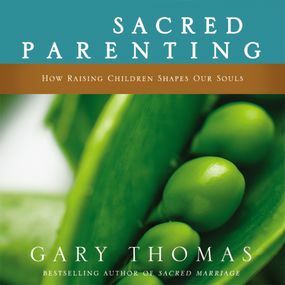 The journey of caring for, rearing, training, and loving our children will profoundly alter us forever.Sacred Parenting is unlike any other parenting book you have ever read. This is not a “how-to” book that teaches you ways to discipline your kids or help them achieve their full potential. Instead of discussing how parents can change their kids, Sacred Parenting turns the tables and demonstrates how God uses our kids to change us.You’ve read all the method books. Now take a step back and receive some much-needed inspiration. You’ll be encouraged by stories that tell how other parents handled the challenges and difficulties of being a parent—and how their children transformed their relationship with God. Sacred Parenting affirms the spiritual value of being a parent, showing you the holy potential of the parent-child relationship.